This shows an interesting combinations of Nordic flags. The Nordics 2007 seems to be an ice-skating competition involving athletes from Denmark, Finland, Norway, Iceland and Sweden. The logotype represents a skater with a "Norwegian" head (and wearing Viking horns), an "Icelandic" left arm, a "Swedish" right arm, a "Finnish" right leg and a "Danish" left leg. 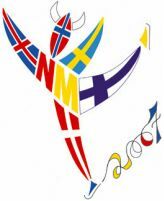 A ribbon attached to the "Danish" leg forms "2007". The body forms "NM", which should be Nordiska Mästerskapen (in Swedish), i.e. Nordic Championship.